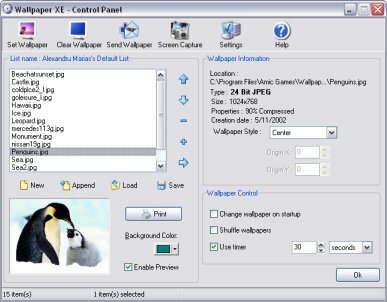 Wallpaper Xe is a utility designed to offer you total and complete control over your own desktop wallpapers. Features: Active Desktop ( great for putting animation, sound clips, or movie on your desktop ), 30 Graphics formats, Timer, Transparent background for icons captions, customizable hotkeys, search disks for wallpapers, screen capture, beautiful easy to use interface, multilingual. Free fully functional download. ...... make your desktop look awesome, but without a good wallpaper changer you would have to manually change your wallpaper, not to mention the limitations and lack of features that Windows default wallpaper changer offers. With our software tool - Wallpaper Xe you can easily set any of your images and movies as desktop wallpapers with just a few clicks! Qweas is providing links to Wallpaper Xe 1.2 as a courtesy, and makes no representations regarding Wallpaper Xe or any other applications or any information related thereto. Any questions, complaints or claims regarding this application Wallpaper Xe 1.2 must be directed to the appropriate software vendor. You may click the publisher link of Wallpaper Xe on the top of this page to get more details about the vendor.